Hemp cane is an important medicinal herb in TČM and our medicine. They are also among the typical representatives of non-edible plants that do not belong among adaptogens. Hemp has a well-known effect against inflammation and pain . 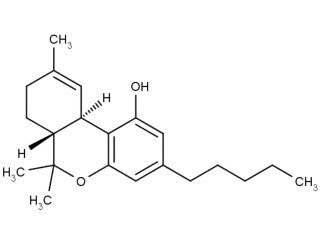 The main cannabis agent is cannabinoids (mainly tetrahydrocannabinol). They are responsible for both the psychotropic effects of this plant and its anti-inflammatory effect. Cannabinoids found in cannabis are a welcome addition or replacement of opioid analgesics ( Elikkottil2009apc , Walker2002can ). Cannabis aids pain from mild to severely ill, but I personally consider its psychotropic effects to be unpleasant, and I avoided using this plant at higher doses. Cannabis has traditionally been used to treat the days and pains of joints and other diseases. In addition to cannabinoids, cannabis contains many other substances: triterpenoids friedelin and epifriedelanol, alkaloids cannabisativin and anhydrocannabisativin, common plant secondary metabolites carvone, sitosterol and many others. Cannabis is not an adaptogen, and I'm sorry I do not have the capacity to deal with it in the same detail as ginseng . Its therapeutic use belongs to the physician. Dried cannabis (marijuana) is now available to us ( , pharmacy map ). 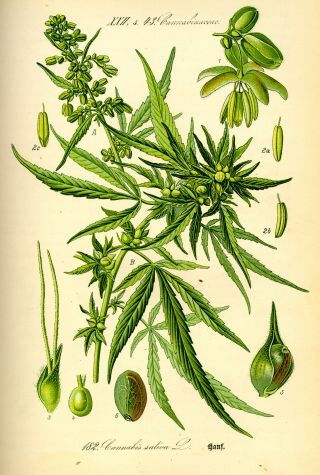 All parts of cannabis : herb cannabis sativae , flos cannabis sativae , resin cannabis sativae , cannabis sativae , and even roots ( radix cannabis sativae ) are used. A cannabis for smoking is popularly called marijuana . Here I would particularly like to draw attention to cannabis seeds that differ from other parts of this plant by being free of psychotropic cannabinoids and in food significantly complements other healthy seeds such as poppy, nuts, hazelnuts, flaxseed, etc. Hemp seed has a pleasant taste and very it is delicious even after spraying. Cannabis cannabinoids function by acting in the body on two types of receptors: CB 1 and CB 2 . CB 1 is present in the brain and cerebellum. CB 2 occurs mainly in the immune system: T and B lymphocytes, macrophages and other white blood cells. While influencing CB1 receptors causes marijuana to have its well-known psychotropic effects, its anti-inflammatory ( Turcotte2016cri ) and analgesic effect ( Shang2016ccr ) is explained on CB2 . Cannabinoids even have the potential to treat autoimmune diseases ( Katz2016mca ). Interestingly, these receptors were first discovered by cannabis, and it was discovered that the endocannabinoid agonists existed in the body. Cannabis hurts especially when it smokes. Smoking (marihuana) and cannabis balm (hashish) harm more than smoking tobacco because (unlike nicotine) cannabinoids extend the trachea. Smoke goes deeper into the lungs, not to mention that jointy packs without a filter. A little less unhealthy is a hookah. Another potential disadvantage of cannabis is side effects of immunity caused by the effect of CB2 receptors (see, e.g., Turcotte2016icc ). Instead of smoking it is healthier to use cannabis as a meal. Cannabis used in food also has a stronger effect because the active ingredients are not evaluated by burning. Hemp recipes can be found here, for example . The use of cannabis in the form of tea is weak, because resin cannabinoids in tea can only be wrong. As for cannabis, it is very healthy, does not contain cannabinoids and has no disadvantages. Although hemp is not among poisonous plants, it is not an adaptogen. Cannabis contains unilaterally acting THC (tetrahydrocannabiol), which causes a state of distraction. In addition, smoking marijuana is more harmful than smoking tobacco. While nicotine narrows the trachea, cannabinoids expand them. Smoke goes deeper into the lungs, not to mention that jointy packs without a filter. It can be questioned whether the well-documented calming effect of cannabis on immune cells ( Turcotte2016icc ) does not aggravate resistance to infection and thus does not even overcome the strict requirements of adaptogens. Hemp is not an adaptogen, but a cure . Than the THC is heavier in this respect. After THC removal, cannabinoids remain cannabinoid-free (mainly cannabinola). Hemp-free cannabis used by per os (ie not smoking) would be similar to other good adaptogenes.